On December 3, 2018, parts of the yield curve inverted for the first time in a decade. Specifically, the difference (“yield spread”) between 3-year and 5-year treasuries went negative. That’s troubling, because if inverted yield curves from the past are any indication, it's a sign that recession is coming. In fact, the yield curve has inverted ahead of every single one of the last seven recessions. 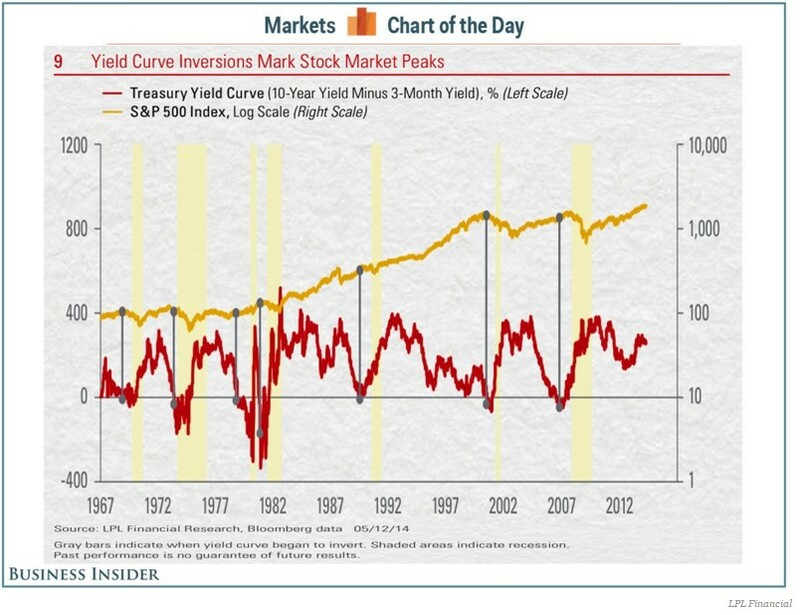 But before we get into what the treasury yield curve is, why it inverts and why its inversion is a harbinger of recession, let’s back up a bit. Yield refers to the return you earn by holding bonds. Bonds are initially sold by the issuer — the U.S. government in the case of treasuries and corporations in the case of corporate bonds — directly to investors. However, investors can then trade those bonds with each other. If you buy a treasury bond from the U.S. government directly (yes you can! ), you can sell that treasury bond to other investors. If investors really like your bond, they might be willing to buy it for more than the $1,000 face value you paid for it. $1,030 / $1,005 = 2.5%. As such, higher demand for the bond has raised its price from $1,000 to $1,005 and lowered its yield from 3.0% to 2.5%. We can generalize the example we just went through into a basic principle: Bond prices and yields move in opposite directions. 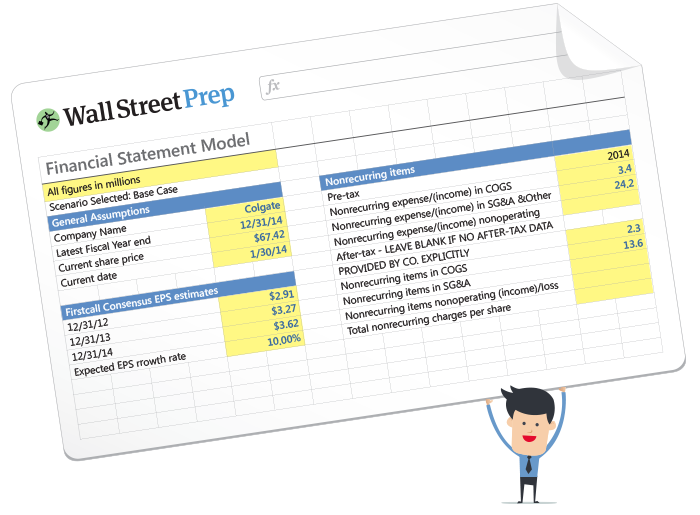 If you don’t understand this concept, make sure to go back and think through our previous example or nothing in the rest of this guide will make much sense. Keep in mind that our example is an oversimplification that will give you enough of an understanding of the yield curve for our purposes here. If you want to understand bond yields like a pro, take our Crash Course in Bonds and get yourself a certificate of completion. Now that you understand yield, let’s get back to the topic at hand: the yield curve. The yield curve is a fancy term for a plot of bonds yields of different maturities but otherwise comparable risk. The treasury yield curve refers to yields across maturities, specifically of treasuries. Sometimes people simply refer to the treasury yield curve as "the yield curve" because the treasury yield curve is sort of a big deal, but there are corporate bond yield curves too. The yields on Treasuries are almost always lower than the yields on corporate bonds because Treasuries are considered risk free. Risk-free because the government is backing them and since, unlike corporations, the US government can just print money so there’s no way the US government would default on its own bonds. There’s just no way. That means that if you were to buy a 5-year treasury on December 3, 2018 you’d get the same annual yield as had you bought the 2-year treasury, and a slightly lower yield than the 3-year. That’s weird, isn’t it? Why would you lock yourself into a longer-term bond without requiring a little more yield in exchange (or even accept a lower yield)? I should point out that technically, no one is actually “locked in” to the term of the treasury they buy. As we’ve noted earlier you can always trade your treasuries. But even though you’re technically not locked in, you should still demand a higher yield from a 5-year over a 3-year. That’s because the price sensitivity of a bond to changes in the current rates offered on comparable bonds is larger for longer maturity bonds than for shorter maturity bonds. That occurs because there are simply more periods in which the holder of the long-term bond is either missing out on higher payments (in the case of higher current rates) or benefiting from above-market interest payments (in the case of lower current market rates). That means that even though you’re not actually locked into a bond, you face more risk for longer maturities should market rates change and therefore would expect a higher yield to compensate you for the additional risk (called interest rate risk). Interest rate risk can be measured using calculations called convexity and duration (again, if you want to geek out on this, take the bonds crash course). So that’s why an upward sloping yield curve is “normal.” Between 1928 and now the yield on 10-year treasuries has been higher than 3-month T bills by an average of 1.6%. The fancy term for the preference for shorter maturities due to interest rate risk is called liquidity preference or risk premium theory. Notice that the yield curve isn’t inverted across all maturities, only in the 2-5 year range. The rest of the yield curve is still normal (upward sloping), meaning investors are (for now) still only willing to buy 10-year and 30-year bonds at yields that are greater than shorter maturity treasuries. 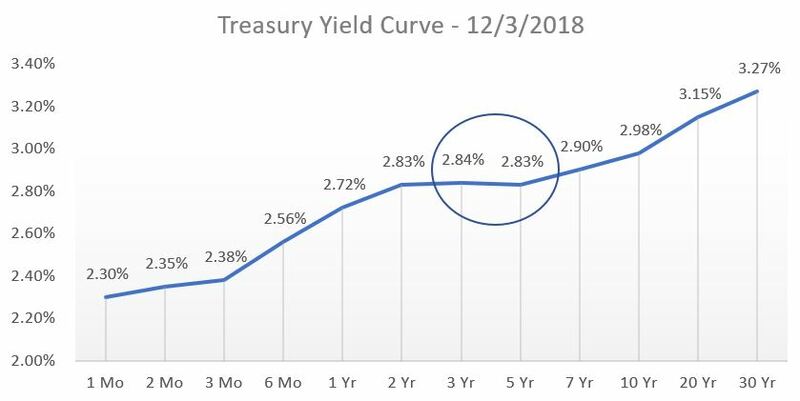 Now that we understand what the yield curve is, and that an upward sloping yield curve is normal, can you venture a guess as to a situation in which someone would agree to buying a 5-year treasury at a lower yield than the 3-year? A big reason could be changing investor expectations about future rates. Imagine investors believed that market yields will go down in the future. In this case, investors will prefer 5-year treasuries at the current-higher-yields over buying 3-year treasuries and then, 3 years later having to deploy the proceeds to buy treasuries at lower yields. The increased relative demand for the 5-year will lower its yield (remember the price/yield relationship). The result is that there’s a certain point where the increased demand for longer maturity bonds could outweigh investor preference for shorter maturity bonds and the yields will invert. Fundamental demand refers to shifts in investor preferences for specific asset classes due to macroeconomic changes. For example, if investors are afraid of a massive economic crisis they will “fly to safety,” meaning they will prefer corporate bonds over stocks, they will start buying up treasuries and gold, etc. Safe things. 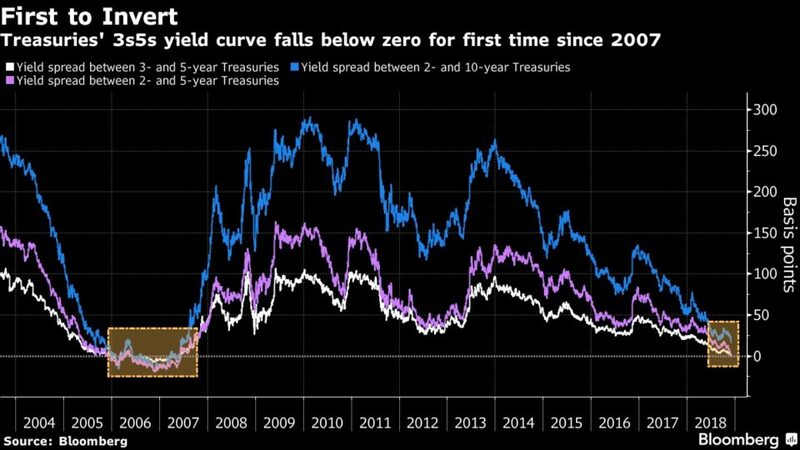 In such a scenario, treasury yields might be expected to decline across all maturities and thus there would be a wholesale shift down in the yield curve. The US benefits from being having the dollar serve as a reserve currency (i.e. other countries like to hold US dollars as reserves to buffer their own currency fluctuations) so unlike many countries, treasuries are not just impacted by domestic demand preferences, but by global ones as well. Refers to the policies related to government spending, taxes and the resulting impact on the national debt. 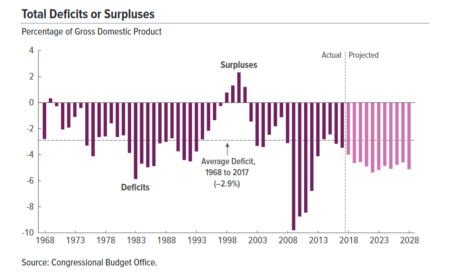 Since governments fund deficits with increased issuance of treasury bonds, the higher the deficits, the higher the supply of treasuries, which lowers the price of treasuries (and thus raises their yield). The fact that the United States has been able to avoid higher yields on its debt despite higher and higher deficits is a result of other factors (like fundamental demand, monetary policy) that we'll talk about next and that obscure this upward pressure on yields. The bottom line is this: All else equal, higher deficits create more supply of bonds and thus push yields up. The entity that determines monetary policy in the United States is the Federal Reserve and is independent from the government (kind of). Whereas fiscal policy is about taxes and spending, monetary policy is about keeping the economy on track. More precisely, the purpose of monetary policy is to manage the ups and downs of an economy. If monetary policy is done right, recessions are short, not too painful, and expansions are reigned in to avoid inflation and a big crash. The Federal Reserve has a lot of tactical tools to accomplish this. But at a very high level, its main power is that it can influence certain key interest rates, which have either a direct or indirect impact on treasury yields. For example, when the economy slows and needs a pick-me-up, the Fed might do some things that will lower short term treasury yields. Lower treasury yields often lead to lower yields on corporate bonds and interest rates on loans, meaning companies can borrow more cheaply, and the economy grows. Conversely, if the Fed wants to slow things down, they can raise short term rates, which does the opposite. The United States is experiencing the longest economic expansion in US history. All good things must come to an end. Increasingly, investors are anticipating a recession. The Fed has traditionally operated on the short maturity part of the yield curve by manipulating short term interest rates (most notably, on the federal funds rate, which impacts short term rates including treasuries). Because the Fed has been raising rates for the last several years (since 2015), the impact over this time has been that rates across the entire yield curve were rising. 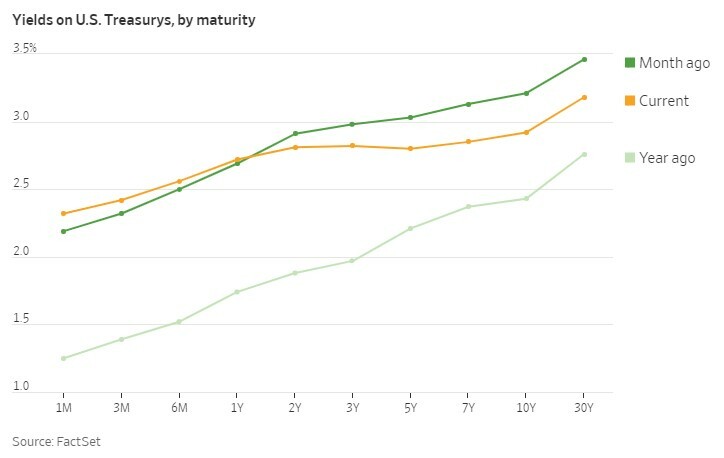 But you can see from the chart above that even though the yield curve is flattening and even inverted in the 3-5 year part of the curve, longer maturities are still upward sloping. That might be due to some Fed manipulation as well. Specifically, the assumption that has guided the Fed in the past is that its efforts on the short maturity side will trickle to longer maturities as well. But that didn’t happen in the financial crisis, so the Fed got creative and just directly bought a ton of treasuries during the financial crisis in order to lower rates (higher demand = higher price = lower yield). That was called “quantitative easing” and the Fed amassed an unprecedentedly massive balance sheet. Over the last few years, it has been offloading those treasuries, which, like its Federal Funds rate increases, raises rates. In particular, it is offloading a lot of 10-year treasuries which is keeping the yields on those fairly high and may be contributing to why that part of the curve has yet to invert. So, while there’s general pressure on treasuries towards inversion due to recession expectations and general future Fed easing, the Fed’s activities are leading to inversions in specific pockets of the yield curve. All these factors have worked together to give us the shape of the yield curve that we see today. And now you know why investors and economists are totally scared of the inverted yield curve! Crash Course in Bonds Used at top investment banks. An insider's look at how bonds are used in fixed income research, sales and trading and investment banking.